Scentsy is one of the fastest growing party plan companies in the United States, Canada, Mexico, Austria, France, Spain, Australia, New Zealand, Puerto Rico, Germany, Ireland and the United Kingdom (England, Scotland, Wales and Northern Ireland) – and it’s a company that encourages you to express yourself and use your own unique talents to develop your own unique business. We are really proud of the Scentsy Home Based Business Opportunity because of the successful track record of producing entrepreneurs who are currently earning a full time income with their very own small business. If you’re absolutely serious about earning or replacing a full time income and have a passion for candles – we encourage you to visit the links listed below and begin your research process to determine of Scentsy is a company that best suits you. If you’re ready to start a Scentsy home based business click here now and go directly to the sign up process. You can read this information in French, Spanish, or German by clicking on the upper right corner up of the link above to change the language or country. Founded in 2004 Scentsy offers wickless candles as safe alternatives to burning traditional wicked candles. Consultants market candle bars, candle bricks, electric candle warmers, nightlight warmers, diffusers, essential oils, room sprays and car candles (air fresheners), laundry care, bath and body and scented kids items. With Scentsy, you will be an independent business person that has the flexibility to set your own hours, determine the amount of your own commission, and earn fantastic rewards for achievement. You will have the opportunity to earn over 30% on personal sales, and receive leadership bonuses of up to 9% of the entire downline volume of the people you recruit and train to sell Scentsy products. 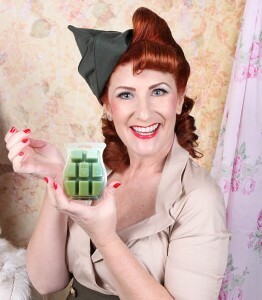 Being a Scentsy Consultant is a personally, and professionally, rewarding experience. To remain a Scentsy Fragrance Consultant, a Consultant needs 200 or more points in PRV in at least one calendar-month within a contiguous three-month period. For just $99 US/$119 CAD/$1,799 (MXN), Scentsy will send you a Starter Kit that includes everything you need to run your Scentsy business-and it all fits conveniently in one shopping bag. ** Contents may vary / If purchased separately, these items would be an investment of well over $300! Our Compensation plan is one of the most generous in the industry. 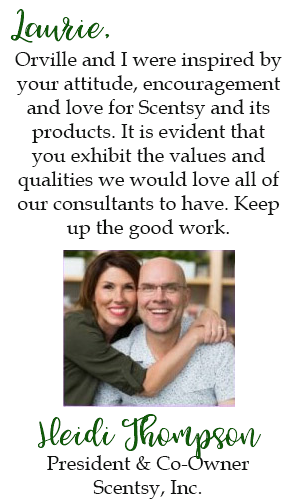 Consultants who meet and maintain the sales requirements for their rank, and are otherwise in compliance with the Independent Consultant Agreement, qualify for commissions and royalties under the Scentsy Compensation Plan. All commissions are based on a Consultant’s Personal Retail Sales of product. Royalties are based Qualified Retail Sales of product. Click here to read about what type of wax Scentsy uses. Download our Free Scentsy Consultant Guide which provides more details about how to start a candle business with the Scentsy Business Opportunity! If you would like a Guide from a country other than the United States, please let me know. For more information why you should join my team please click here. Ready to start your Scentsy business today? Click here to get this party started! Q. How much does it cost to get started? Q. What does the Starter Kit include? A. Everything you need to do your first Scent Event. Contents vary but the value stays the same. You could get something along the lines of: order forms, invitations, blank cards, catalogs, a warmer, scent pak, candle bar, scent circle, room spray, host envelopes, start-up guide, training DVD, buy/host/join brochures, light bulbs & 1 set of full size party testers (scent samples). Q. How much do I have to sell to stay a consultant? A. In order for your account to remain eligible to retain downline, you must generate 200 points or more in PRV in at least one calendar month within a three-calendar-month period. For example, if your PRV for the month of June is 200 or more, you will be eligible to retain downline for the next three months; July, August and September. If your PRV totals are 200 or more in September, your account will remain eligible to retain downline for October, November and December. If the required 200 in PRV is not met in any one of the months within the three-month period your account will be purged on the 1st day of the following month. Q. How much money can I make? A. You can earn 20-39% on your own sales & leadership bonuses of up to 9% of the entire down line volume of the people you recruit & train to sell Scentsy products. Q. How long has Scentsy been around? What is the growth potential? A. Scentsy was started in 2004. The quality products are second to none. They provide a safe alternative to burning candles so they appeal to a wide customer base. Because the products are consumable, they also prompt reorders. The company has experienced incredible growth as this concept has taken off. Signing up today is advantageous for you because the company is still new & growing rapidly. Take a look at this growth chart from July 2016 showing how much opportunity is available to new consultants. Q. Do I have to buy a lot of inventory & keep it stocked to do parties? A. No. You order the products on your consultant workstation when customers order from you. Q. How can I sell Scentsy? A. ScentEvents (Home Parties), SampleEvents (Basket Parties) – these are catalog parties with small scent samples your hosts can take to work, bunco, bowling, family gatherings, or wherever to show & collect orders, website orders & re-orders, fairs/expos, fundraisers, etc. Check the consultant start-up guide for complete information. Selling Scentsy through online auctions (E-bay) or through retail establishments is not permitted. Q. How do I get paid commission & bonuses? A. You collect the retail price (plus tax* & shipping** if applicable) from customers & pay the retail price when you enter the order. Scentsy deposits your commission on the 10th of each month to your pay portal. This account & a pay card will be provided by Scentsy when you join. You will receive your commission & bonus for the total sales you & your team (if applicable) made during the previous month. (You must sell $500 in the previous month to qualify for the leadership bonus). * The tax rate is based on the zip code where the order will be shipped. Most orders will be shipped to you so check with your local state or county government to find out what your tax rate is (sometimes there is more than one tax rate for an area so check which one is for non-food items). If an order will be shipped to someone’s home directly, charge the tax rate for that destination. Tax is automatically calculated when you enter the order. ** In the U.S. shipping is free on party orders of $200 or more unless the customer wants the order shipped directly to a specific address instead of to the consultant or hostess. Then there is a 10% shipping charge (20% to addresses in Hawaii or Alaska). Q. What payment types can I accept from customers? Are there credit card processing fees? A. In the U.S. you can accept personal or business checks made payable to you, cash or credit/debit cards (American Express, Visa, Discover, Master Card). Consultants do not pay credit card processing fees. Q. Do I have to pay for all of the rewards a host gets for having a party? A. No, Scentsy covers it all. If you don’t use all the host rewards there is a $5 host fee charged to help cover shipping expenses. So the solution is to take all of the half off and product credit that is earned, and the $5 fee will not be charged. Q. Is there training available? A. Absolutely. I’ll train you personally. I’ll make sure you’re ready for your first party & answer any questions you have after that. We also have a private team Facebook group and Scentsy also provides weekly training calls, a full training center & they sponsor annual regional meetings & an annual convention (at the end of July). Q. What do I do if I have a question? A. Read the consultant start-up guide as soon as you sign up. It’s available in the Resources section of your consultant workstation & will be included in your kit. It answers most questions but you can always contact me if you want something clarified. Quickest way to contact me is email. I pride myself on getting back with team members same day, generally within a few hours or less. Another source for answers is our team Facebook page. You will be sent an location of this site once you are enrolled. News updates are also posted from the company on your Scentsy consultant workstation and emailed directly each week. If you can’t reach me & you haven’t found what you’re looking for submit a Support Ticket in your workstation or call Consultant Support at 1-877-855-0617. Q. How often are the products & catalogs updated? A. Scentsy Fragrance catalogs are released twice a year in March & September. Consultants can purchase the new catalogs & scent samples in February & August when the new & discontinued products are announced. Q. Can I have my own Scentsy web site? A. Yes. Online sales & reorders are a big part of our business. You can subscribe to a Scentsy sponsored website so customers can order & reorder whenever it’s convenient for them. Your website subscription is free for the first three months after you sign up & $10 per month after that. If you choose to create a website that is not sponsored by Scentsy, there are certain restrictions. See the handbook for complete information. 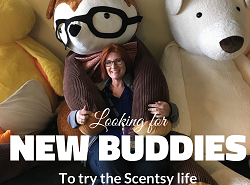 Newsletter – The $10 monthly web site fee also includes a newsletter for customers (Making Perfect Scents) that Scentsy creates & sends to your list of clients through email. You just set up the email list in the Contacts section of your consultant workstation. Q. How do I get marketing materials & business supplies? A. Business supplies (catalogs, order forms, scent samples, generic business cards & invitations) & marketing materials (custom business cards, invitations, banners, clothing, pens, buttons, yard signs, etc.) are available through Scentsy Success in your workstation. Flyers for monthly specials are available to download & print in the Resources section of your consultant workstation. You may also order them through Scentsy Success or receive them in the Scent & Warmer of the Month kits. Create your own – If you’d like, you can make your own flyers, invitations, etc. Just get approval from Scentsy before printing & distributing. Q. Great! How do I sign up to be a consultant? A. You sign up through my Scentsy website . Once you’ve agreed to the terms & conditions & paid for your starter kit, a consultant number will be assigned to you. Scentsy will then contact you through email to give you a URL for your personal Scentsy website where customers can begin ordering. I will also send you a welcome letter detailing more information about our team. I would expect that you’ll have many more questions about operating your Scentsy business, but these above are often asked by both potential and current consultants as well as hosts and customers. As Og Mandino said, “Take the attitude of a student, never be too big to ask questions, never know too much to learn something new.